A joyful class for petite princesses and princes. This class incorporates ballet exercises for feet and legs, as well as stretches, which are practiced in each class. Dancers are given a brief ballet barre. Folk and character dance movements are practiced in center floor. These include gallops, turns and group formations traveling in circles and lines. Across the floor dancing includes many types of turns and jumps. Junior Ballet (Ages 4 - 7) Where it all begins! Inspired by the classics, this program introduces basic ballet, folk and character steps to our youngest dancers. This class begins with footwork and leg stretches, while sitting in a circle. Our ballet barre includes basic ballet positions for the arms and feet, as well as ballet movement for the legs, arms and upper body. Center floor dancing is filled with balances, turns and jumps, all of which are age appropriate for these young ballerinas and male dancers. Ballet I (Children Ages 8 & Up) Dance Your Dream, Young dancers learn ballet technique, taught in the Russian Vaganova style, with emphasis on carriage of the upper body. Our ballet barre portion of the class teaches technical movement of each dancer's arms and legs. Our center floor dancing includes foot and leg exercises, balances, a variety of turns, small jumps and each dancer's favorite movement and running leaps.The mental and physical training at this level is integral to each dancer's development. Ballet I & II This class is designed to challenge both level I and level II dancers. Our Ballet barre starts with plie's and ends with grand battements (large kicks). Pirouette and pique turns are practiced weekly and petite allegro (small jumps) and grand allegro (large jumps) are incorporated in each class. Ballet II Dancers: In this level, dancers train at least two days per week. Ballet barre is extended to forty minutes and includes the complete range of exercises such as plies, tendus, jetes, rond de jambes, fondus, frappes, developpes and grand battements. Dance combinations in the center floor are increased in length and difficulty and dancers begin work on double pirouettes and double pique turns. Petite allegro (small jumps) may be executed to a faster tempo and grand allegro (large jumps) now includes tour jetes with three and four types of jumps in each combination. Ballet IIA, III and IV: In this level, dancers train three to four days per week. Dancers practice a forty five minute barre at the beginning of each technique class. Center floor usually begins with an adagio (slow moving combination of movements). Adagio includes balances on flat foot and on demi point, high developpes and slow moving pirouettes. Petite allegro (small jump) combinations increase in length, speed and technical difficulty, while dancers strive for multiple turns during all pirouette and pique turn combinations. Grand allegro (large jump) exercises also increase in length, speed and difficulty. Ballet III / IV: Dancers in this level ad a fourth ballet class on Fridays. This includes a ballet barre, point class and variations ( portions of ballet choreography from the classics or an upcoming ballet performance). All portions of the III / IV level strive for advancement by fine tuning technical execution and training the body with floor barres and therapeutic work. Dancers in this level are often chosen as principal dancers in our upcoming ballets. A pre pointe class is exactly that, the class you take right before starting point. In such a class, you will strengthen your feet and work on proper technique to avoid injury on point. In a pre point class, dancers wear demi point shoes (basically de-shanked point shoes) to prepare for future work on point. Dancers must train a minimum of one to two years before enrolling in a pre point class. 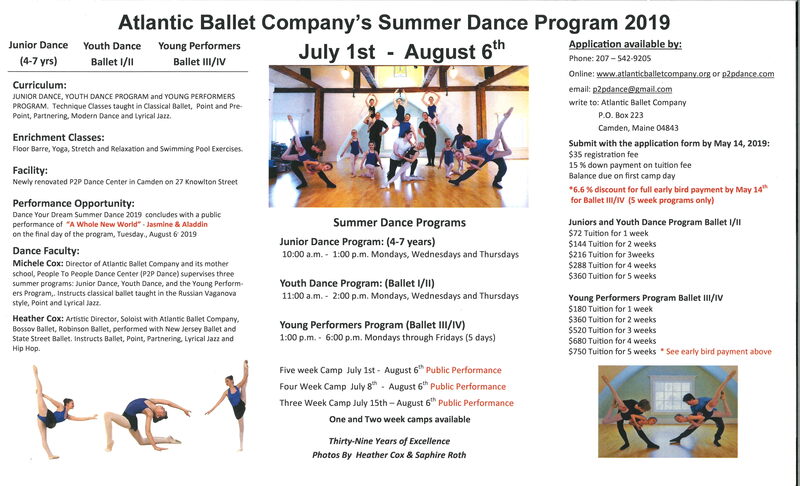 This class is designed for juniors, as well as ballet level I & II dancers. Both boys and girls enjoy the downbeat of this rhythmic dancing. Junior Jazzin' is inspired by today's Hip Hop craze and Jazz Dance. Hip, shoulder and rib cage isolations reflect the rhythmic downbeat of this Jazz music. Basic gymnastic tricks are often taught in this class, such as bridges, backward roles and cartwheels. The Jr.Jazzin' portion of this class is designed for juniors, as well as ballet level I & II dancers. Both boys and girls enjoy the downbeat of this rhythmic dancing. Junior Jazzin' is inspired by today's Hip Hop craze and Jazz Dance. Hip, shoulder and rib cage isolations reflect the rhythmic downbeat of this Jazz music. Basic gymnastic tricks are often taught in this class, such as bridges, backward roles and cartwheels. The ballet I portion of this class teaches young dancers ballet technique, taught in the Russian Vaganova style, with emphasis on carriage of the upper body. Throughout the year, ballet exercises are gradually added to the ballet barre, starting with plies, tendus, jetes and eventually rond de jambes, fondus and frappes and finally developpes and grand battements. Our center floor routine includes balances, a variety of turns, small jumps and each dancer's favorite movement, running leaps. The mental and physical training at this level is integral to each dancer's development. Rehearsal time to practice and refine routines and performances for upcoming presentations.